Every car owner should know the basic of car care for vehicle owners to keep the car in good condition, reduce maintenance costs, and minimize the risk of accidents. There are hundreds of parts in a car and each possesses its own peculiar maintenance needs. The engine, carburetor, tires, bodywork, electrical systems, and lighting components are the major areas that need regular maintenance. However, the car owner would not be able to attend to them all of them individually. An expert service mechanic would be required to keep the car in good condition. Still, each car owner could look at a few basic maintenance works that could be easily done without the assistance of a car service engineer. Apart from these precautions, one aspect of car maintenance that is crucial is known as smart repair. This should never be ignored by any car owner. If you’re a more casual car washer, you might have never even bothered with carnauba wax before. SMART is the acronym for Small to Medium Area Repair Technology. This technology is specially designed to rectify scratched, chipped, and dented paintwork in the car body or plastics, and to correct scuffed alloys and scuffed bumpers. Even dent repairs, mirror casing repairs, bumper repairs, alloy wheel repairs, vandal scratch repairs, windscreen repairs, leather seat repairs, upholstery repairs, and interior trim repairs are generally included in Smart repairs. 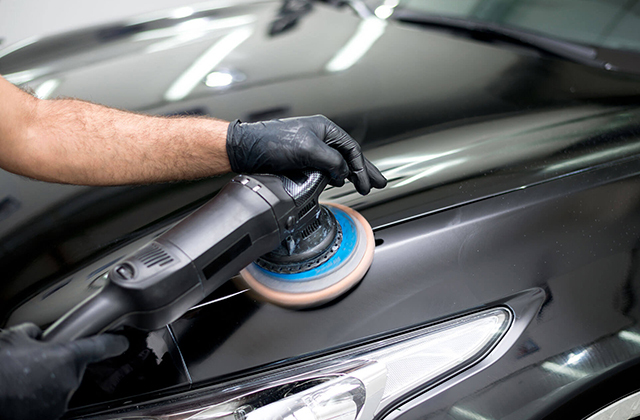 If you find minor scratched paintwork or vandal scratch defects on your car, you would be able to rectify it without taking your car to a service station, but only if the paintwork has not been broken. This should only be attempted by individuals with a sound knowledge of vehicle paintwork, as it is very easy to make the damage even worse and could lead to further costs. You should obtain a scratch/swirl remover. Then you should use a 100% soft cotton cloth for buffing the scratched area with the scratch/swirl remover. After buffing the area, you should use a car wax to wax the area for added protection. You should be careful to use only a 100% soft cotton cloth or a microfiber towel. Other cloth materials would scratch the paint even more. The cloth or the towel should be clean and dry. The buffing should be done only under shade. Direct sunlight should be avoided. The waxed and polished layers would be removed if you use a washing detergent for cleaning the car. The car bumper is a crucial safety part in your car. It is the bumper that protects the car and the inmates to some extent when a collision occurs. The bumper could also be damaged when it scrapes against walls, trees, and other abrasive surfaces. Since majority of bumpers are made of plastic nowadays, they scratch quite easily. The bumper would not only look ugly but the resale value of the car would also be reduced. A full-fledged vehicle bodyshop might charge you too much for minor bumper repairs. On the other hand, you would be able to find several smart repair companies that would be quite reasonable priced in comparison. You should also check up whether painting is also needed along with the bumper repair, this could be done at the same time by a professional. Dent is a common occurrence for any car. Certain dents could be fixed by you at your home; while certain others would require a full bodywork repair. If the dent is quite small, you need not approach a full body shop. You should obtain the services of a dent repair specialist. These repairs are relatively quick for a professional to carry out, and can be done easily at your home or place of work. This type of repair is non invasive and usually does not require any painting after the repair. Windscreen repairs are not something that you could do at home. It is the job of a professional. Normally, any chipping or cracking in the windscreen for less than 10 cm long could be rectified by a windscreen specialist. If the chip or the crack is more than 10 cm, then the windscreen should be completely replaced. As an immediate measure, you could use a transparent tape to cover the chip or the crack for keeping the dirt out, until you call a mobile windscreen repair specialist. Smaller chips or cracks are repaired by the technicians with resin injections. Alloy Wheel damage is a common problem, today most vehicles on the road come with alloy wheels as standard, or if not have had sometimes very expensive aftermarket alloy wheels fitted. Rather than replacing the wheel because of damage to either the rim or the spokes, you may decide to use the services of a mobile alloy wheel repairer in your area. Many general Smart Repairs companies also do alloy wheels or you could arrange for a company that specializes in wheel repairs to come out to you to do the repair at your home or place of work for convenience. Always ensure whoever you use, finishes the wheel with quality finishes and a 2K lacquer as this will leave a tough and durable, long lasting finish. The other most important factor is that the re-finished wheel is an exact match to the rest of the wheels on your vehicle. Leather Seat damage, i.e. wear to the side bolsters, base or minor cracking can be professionally repaired by smart repair technicians. Any damage to the leather seat is repaired first, even cigarette burn damage or small splits or tears can be repaired, and then a texture or grain to match the leather on your vehicle is added and last but by no means least the repaired area is colored or dyed to match your seats. More and more companies nowadays are using a spectrometer to ensure an exact color match is achieved. A well carried out leather seat repair will be backed up by a lifetime guarantee, and is seen a permanent repair and shouldn’t fade or discolor if done well. This type of repair can also be carried out at your home or place of work. Copyright (c) http://www.smartrepairs.co.uk August 2009. At SmartRepairs.co.uk we aim to spread the message of the SMART Repair industry to individuals who have not heard of this relatively new motor industry phenomenon, it has the tools available for companies within this field to advertise their business and connect with each other to learn any new information which may be useful to them. ← What is an Auto Mechanic?